It is a pleasure to review a video made by a watercolour artist with whose opinions and methods one is in complete agreement and sympathy. James Fletcher-Watson is a traditionalist in the best sense of that word and relies for his effects upon full washes of pure colour which allow the paper to shine through. He eschews the use of body colour and relies upon a limited palette for his delightful effects. He is a firm believer of painting "en plein air" and of drawing his inspiration direct from nature. James is an advocate of the large brush in preference to the small, whenever possible, as an aid to achieving bold effects and eliminating unnecessary detail. He uses a small watercolour box and replenishes the pans he intends to use from tubes at the beginning of each painting session. The artist advises us to have a sketchbook always at the ready and to make several rough impressions of our chosen subject as an aid to deciding upon the most attractive composition. He stresses the vital contribution good watercolour paper can make-to the success of a painting and warns us not to be tempted to make a difficult task harder by using inferior materials for reasons of economy. James's first demonstration is of a tree in winter and he makes two preliminary sketches from different positions. He dampens much of the sky but leaves some dry areas in order to obtain a blend of hard and soft-edged cloud effects. The artist then applies washes of pure ultramarine, merging into a mixture of cobalt and light red over the horizon. A stronger mixture of burnt umber and ultramarine is used for the trunk of the tree with Winsor blue, raw sienna and burnt umber for the ivy climbing up it. The distant bank of trees is rendered in a wash of cobalt and light red. Cadmium yellow, Winsor blue and a touch of burnt umber are used for the rich green of the foreground grass. 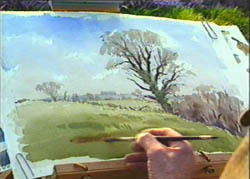 Next comes a quick but telling impression of a snow scene and this is followed by advice on colour mixing for such features of the landscape scene as skies, clouds, distant trees, foliage, grass, masonry and tiles. The next demonstration painting is of an attractive Cotswold water-mill and for this the artist does some careful preliminary drawing. 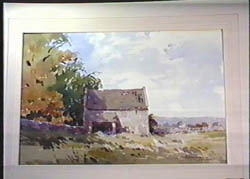 He alters the position of some trees in order to widen a gap through which the distance is glimpsed and deepens the tone of the other trees to provide contrast with the pale sunlit walls of the adjacent mill, improvements which strengthen the composition and heighten the impact of the painting. The final outdoor demonstration is of a small barn and again two exploratory sketches are made, the second being chosen as the basis for the painting. Finally we are shown a number of the artist's finished watercolours. James Fletcher-Watson is not only a popular and talented painter but is also an effective and experienced teacher with the ability to comment clearly and helpfully on what he is doing and why he is doing it. He describes his methods fully and holds nothing back. This is a video I can recommend with confidence to all those interested in the English watercolour tradition. 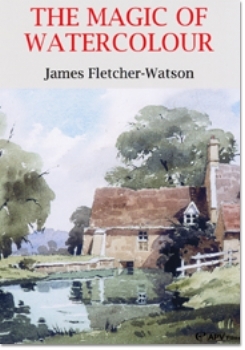 James Fletcher Watson�s The Magic of Watercolour starts from first principles with a simple technique and a loose and limpid style based on traditional values and the example of past masters such as Girtin, Turner, Cotman, Cox, Constable, et al. It contains the almost obligatory demonstrations of skies, trees, water, buildings, etc, but there are plenty of useful hints on how to combine these elements into a coherent landscape. There is also much useful advice about suitable colours and colour mixes. For those who aspire to the painting of traditional English landscapes in a traditional manner this tape provide an excellent start with sound advice.